Amid joyful songs and graceful dances, Marco Polo Plaza lights up one of the most beautiful Christmas trees in Cebu to mark the beginning of the festive season. But this isn’t just any ordinary holiday decoration; it is the Christmas Tree of Hope. CHRISTMAS POEM. Marco Polo Plaza general manager Brian Connelly reads a Christmas poem to mark the lighting of the hotel’s Tree of Hope. During this season of giving, the Tree of Hope accepts donations for underprivileged Filipinos through hotel partner GMA Kapuso Foundation. Marco Polo Plaza General Manager Mr. Brian Connelly said during the lighting of the Christmas Tree of Hope last November 25, 2017 that it has given more than a million pesos to aid in such projects as Unang Hakbang sa Kinabukasan, Give a Gift Project, and Operation Bayanihan. One of the performances during the event. Becoming part of this exemplary enterprise is easy. 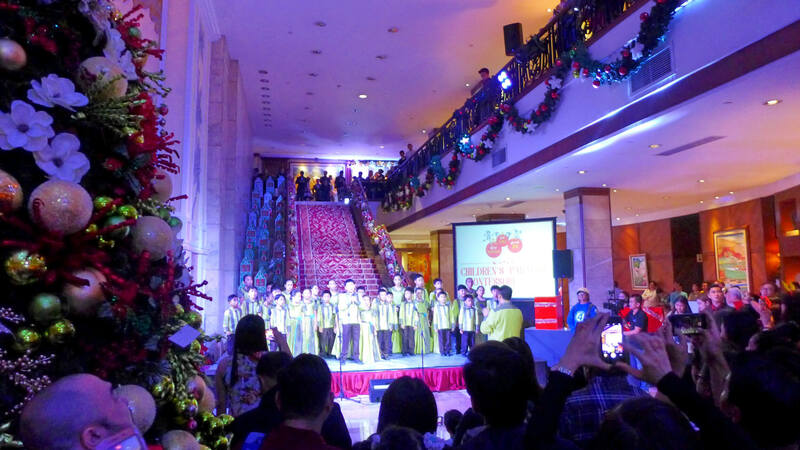 All you need to do is buy a Christmas ball for 200 pesos each and you get to hang it on the Tree of Hope with your good wishes, said Marco Polo Plaza Communications Manager Manna Alcazar. The hotel has partnered with one of the world’s top airlines, Cathay Pacific, for Christmas 2017 so donors get a chance to win something for themselves when they donate to the Christmas Tree of Hope. Those who buy two or more Christmas balls get a raffle ticket and a chance at the round trip flight to Hong Kong prize care of Cathay Pacific. Performances by the Children’s Paradise Montessori Choir, Cebu Centre for Dance, Dreamcatchers, and GMA’s Migo Adecer entertained guests during the tree-lighting ceremony. GMA 7 Cebu station manager Ann Marie Tan. Connie Cimafranca of Cathay Pacific. DONATION. Buy a Christmas ball for 200 pesos each and you get to hang it on the Tree of Hope with your good wishes. If you buy 2 or more, you get a raffle ticket and a chance at the round-trip flight to Hong Kong prize care of Cathay Pacific. The beautiful Tree of Hope dominates the Marco Polo Plaza lobby.